I am getting ready to order another batch because they are doing so well where I live. I have happy plants that are thriving and doing well and I am a happy customer who loves her plants and how well they are doing. I have heard from so many neighbors saying that they enjoy seeing this plant. They want to order too! Amazed at how quickly this plant is growing! Hummingbird Plant- Campsis radicans. The Hummingbird Vine, also known as the trumpet vine, is a fast-growing perennial vine. This plant is typically easy to grow and is great for attracting hummingbirds. The flowers are tubular and vary in color, ranging from yellow to red to orange. They tend to bloom from the summer to the fall months, but this does depend on their location. The vines themselves can reach lengths of 40 feet and are very robust. Although the Hummingbird vine does prefer to grow in well-draining soil, it can adapt to most land and are not hard to build. 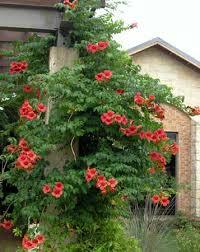 They do not require much water or fertilizer and need regular pruning if placed in a residential area. Hummingbird plant is fantastic and can be created with herbs to help attract those beautiful hummingbirds to a lawn or garden area. This vine is excellent and can grow to produce tubular flowers that also help with attracting these gorgeous tiny birds. They love sweet flowers that provide a lot of nectar. 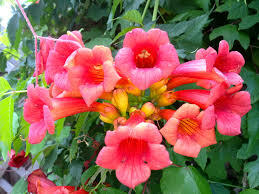 Campsis radicans has a few other primary names including trumpet creeper or trumpet vine. It is an enduring vine that becomes efficiently and primarily in an obtrusive way. As its titles recommend, the trumpet formed tubular blossoms attract hummingbirds with its brilliant yellow, orange or red hues. Hummingbird Plant Flowers speak the truth three inches in length. Blooms start showing up amid the late spring and endure into fall. Shady conditions may abbreviate blossom times. Toward the end of the blooming season, appealing seedpods that are formed like beans are delivered. The robust woody vines can ordinarily intense out the wintertime and return the accompanying spring. Pruning is expected to help control excess. It can be difficult to rule back if it begins developing wild. The vine ought to prepare against an in number backing. Then again, a house or other building utilized as backing could come about as a part of auxiliary harm from the roots or even rooftop damage from the vine itself.